The end of the year is almost here!!! 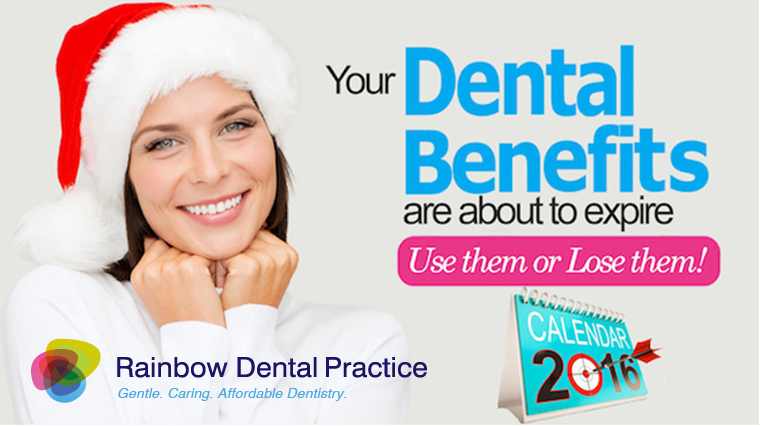 Do you know that your private health insurance dental benefits for the year are about to expire? Normally, the private health funds do not allow to rollover your benefits – so if you haven’t already used them, you will lose them! For these benefits, you have already paid for through your monthly or yearly premiums for private health, and of course you are entitled to. Why not make the most out of them and use them before they expire? One of the most important treatments and the least “tormenting” is a normal check-up and clean of your teeth. Do you know that a simple check-up today can prevent a filling (or Root Canal Treatment, or an extraction or …!) tomorrow and saving you a lot of money, time and annoying pain? Seeing the dentist for these regular check-ups helps you to maintain a great dental health and hygiene. So, if you have private health insurance, it is very a good idea to take advantage of its benefits. And as we have already mentioned, at the end of the year you should want to maximise the use of your private health insurance. During these school holidays, it may be a good idea to also book in your children that are covered as part of your private health insurance. Have a look on your health policy or contact your health fund for information regarding your private health plan. Give them a call! This is the easiest way to find out about your benefits. If you need complex treatments (root canal, crowns, dental implant, braces etc.) with more than one session, it is a good idea to book in these appointments before the end of the year to take full advantage of your benefits. Please don’t hesitate to contact our friendly staff on 02 8021 5285 as soon as possible and we will ensure that we try our best to secure a time for your appointments before the end of the year.